DUBAI Properties, the largest master developer in Dubai, wants to tie up with Malaysian property developers for its on-going projects there. The unit of government-owned Dubai Holding hopes to lure developers, contractors and real estate agents to invest in its booming property market. "We are targeting mid-sized to big established developers with a minimum investment (capital) of US$100 million (RM327 million)," deputy chief executive officer Yaqoob Al Zarooni told reporters after a presentation on its Dubai projects, held in Kuala Lumpur yesterday. Dubai Properties, which does not have a local partner, spoke to several developers yesterday. "However, the discussions are very initial because such projects require due diligence and feasibility studies to be carried out beforehand," he said. Dubai Properties, with an estimated US$100 billion (RM327 billion) ongoing projects, also wants to work with Malaysian real estate agents for the sale of its units, said sales development director Abdel Rahman Almadhloum. Its biggest project is the recently launched US$60 billion (RM196 billion) green initiative covering 880 million sq ft. Dubbed the "Sheikh Mohammed Rashid Gardens" project after the country's ruler, it comprises four clusters and 73 per cent greenery. It will house a zoo, gardens, hotels, museums and higher educational institutions. Other developments include its US$30 billion (RM98 billion) business bay, US$13 billion (RM43 billion) mixed-development known as the culture village and a US$15 billion (RM49 billion) housing estate. Yaqoob said that with large projects such as the 64 million sq ft business bay, local developers could save on marketing and promotional costs due to the overall project's market visibility. "Also, logistics here is easy - you are able to establish your office within a couple of months," he said. Yaqoob said the Dubai property market offers diversity with various foreign developers from South Korea, Japan, Europe, South Africa and Australia. However, developers have to work within the theme created for each project, he added. Senior consultant Walid Hareb, who heads Dubai Consultancy, said there was a possibility of setting up a Malaysian theme city in Dubai. "Malaysia has its uniqueness in terms of culture and heritage so the developers can bring these elements there," he said. AMCORP and the Sarawak Housing and Development Commission (SHDC) will invest RM1 billion in the re-development of the Sibujaya township located about 26 kilometres from Sibu. Sarawak Housing Minister Datuk Seri Abang Johari Tun Openg, in announcing this today, said the re-development would give a new and futuristic look to the township, the biggest medium- and high-end housing project in the state. This, Abang Johari said, was based on the re-development plan which won the Judges Merit Award in Community Development (Planning Achievement) this month. Sibujaya was also the first project in East Malaysia to have won the prestigious award by the Malaysian Institute Of Planning, he said at a press conference at the SHDC office in Sibujaya. According to him, the re-development will emulate that of the Mutiara Damansara township in Kuala Lumpur. Abang Johari said the re-development plan was initiated as Sibujaya, which had been launched in 1995, could not sell some of the houses built. “The plan was conceived some time ago when Amcorp was constructing all the commercial buildings and the SHDC handling the houses. Now we have formed a joint-venture company to handle development of the 283 hectares left idle,” he said. “We are looking into building about 6,000 units of medium- and high-end houses as well as 400 units of commercial buildings. We had previously developed an area of 161 hectares with over 4,000 units of houses and 170 commercial buildings,” he added. Abang Johari said a major attraction of the new plan was a 16-hectare green lung to double up as a sort of botanical garden where timber species and fruit trees such as durian and dabai (Sarawak black olive) would be planted. Another feature of the Sibujaya township project was a covered walkway built along the fringes of the green lung and linking all houses to the commercial area and schools, he said. A RM20 million police station was also being constructed at the township. Abang Johari said the Sibujaya township population is projected to grow from 25,000 currently to about 100,000 in 10 years’ time following the re-development effort. Property value in the township is also expected to increase by between 30 and 50 per cent, he said. KOTA KINABALU: UEM Land Bhd is in talks with three foreign parties to develop its flagship township Bandar Puteri in Bandar Nusajaya, southern Johor. UEM Land managing director Wan Abdullah Wan Ibrahim said Monday the parties involved were from Australia, India and the United States. “They are interested in participating in the development of Puteri Harbour,” he told reporters at the sidelines of the CEO international conference. Puteri Harbour is a 688 acre mixed development component within Bandar Nusajaya and it would comprise of residential and commercial properties. The involvement of the foreign parties would enable UEM Land to leverage on their networks and reach to showcase the projects overseas, he said. UEM Land has to date signed two joint ventures for the development of Puteri Harbour. The first was with Limitless LLC to develop a RM1.6bil project comprising of canal homes and condominiums on 111 acres. The second is with Damac Properties LLC to develop a RM3.8b project comprising of offices and condominiums on 43 acres. UEM Land has lunched three residential projects in Bandar Nusajaya in the past 2 1/2 years. Nusa Idaman comprises of medium cost homes while Horizon Hills is a gated 1,200-acre joint venture property project and East Ledang which comprises of landed properties. PETALING JAYA: Mutiara Goodyear Development Bhd is teaming up with Tambun Indah Sdn Bhd for a residential development project in Seberang Perai, Penang with a gross development value (GDV) of RM776mil. Mutiara said the development would be carried out on three parcels of its freehold land measuring 253.7 acres. These parcels are part of the 710 acres owned by Mutiara. It set up a joint-venture company, Tambun Indah Development Sdn Bhd, in which Mutiara unit Pembangunan Bandar Mutiara would hold 30%. Tambun Indah's two shareholders would have the balance 70%. Under the exercise, Tambun Indah Development would buy the land from Mutiara for RM123.5mil and then undertake the project. One of the luxury houses visited during the tour. 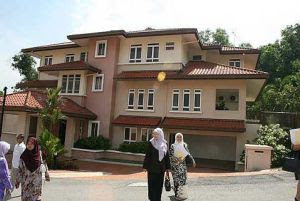 The area in Shah Alam where luxury bungalows have been built by the former state government for its exco members and their families has been likened to a hillside resort. This was how state housing committee chairman Iskandar Abdul Samad described the place during his maiden visit to the area, which has been dubbed exco village. The RM21mil exco village in Section 7 has been left abandoned since the Pakatan Rakyat government wrested power from the Barisan Nasional in the March general election. A set of Chesterfield leather furniture in the lounge. “This is actually a resort which offers cosy homes for holiday makers and I cannot imagine myself staying here. “It is luxurious and I don’t think it’s proper to house the exco members in such homes,'' he said after visiting the place with a group of real estate agents. Iskandar said the representatives from five real estate agencies had been taken on a tour of the place so that they had a clear idea of how to sell the place. He said they were taken to three of the bungalows and saw for themselves what the area offered. A typical breakfast nook in each of the houses is furnished with dining furniture. Iskandar said the area had been built with a mix of 10 bungalows, including double-storey and two-and-a-half storey bungalows with five bedrooms with attach bathrooms. He said all the bungalows had a living room, family area, music room, dining area, breakfast room and a kitchen. 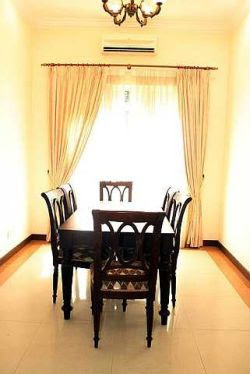 A 14-seater table in the formal dining room reflects the kind of lifestyle envisaged by the exco village planners. Besides the houses, there is also a clubhouse and a swimming pool at the hillside scheme. Iskandar, who was seen photographing the area with his digital camera, said the settlement had been well designed with a scenic view of the surrounding area. “I hope these features can be the selling point to attract people to occupy the houses here,'' he told StarMetro.